What is a Pneumatic Tanker? A Pneumatic Tanker is a large body tank trailer that empties via a pump and forced air. It is primarily used to transport building materials, food products and chemical products. the cargo is in a vacuum-sealed tanker during transport, which prevents outside air from entering. This protects the product from moisture and contaminants such as germs and mould. Pneumatic tankers are generally manufactured with a single compartment for loading into. The tanks are made of aluminium or steel with capacities ranging from 560-3120 cubic feet. Previously multiple ‘hoppers’ or compartments were also available but aren’t in use much today. Building products: cement, sand, ash, and lime. The pneumatic system uses compressed air to move the load through pipes and compartments. Hence correct mechanical understanding and operating procedures are required to ensure the unloading process is smooth, and that the tanker is well-maintained. The main risks are to the cargo and to the tanker itself due to blockages and breakages, however there are also risks of injuries to staff due to air pressure leaks. Operation of modern Pneumatic Tankers can now be done at ground level which greatly reduces the risk of a fall. In the unusual event where a driver has to climb onto a tanker, there are secure ladders and handrails to reduce this risk. 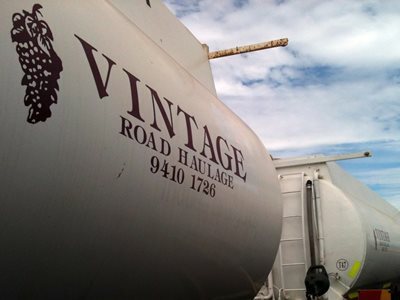 Vintage Road Haulage transports all kinds of freight around Perth and Western Australia and has done so since 1994. Please call (08) 9410 1726 or email using the contact form. Need a Reliable Transport Company?